Traditional Jewish Chicken Soup is known for having a golden, clear broth with essential nutrients to revive you right out of your sick bed. It makes sense why homemade Jewish chicken soup is also famously known as “Jewish Penicillin”. Every Jewish Mama will insist that their chicken soup is the best chicken soup, because it is made with LOVE. Making your own broth from scratch is very easy. Simply place the whole chicken in the pot with root vegetables, fresh herbs, cover with water, and walk away from the stove for a few hours. You might wonder, “Why would you boil a whole chicken with the skin on? Isn’t there a lot of fat in the skin?” Well, there is a very good reason for that. Chicken skin is actually rich in collagen and not all fat. 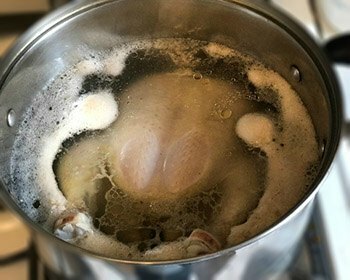 Leaving the skin on the chicken while it simmers in water will help produce a rich flavor in the broth. The skin will also help produce a beautiful golden color that makes Jewish chicken soup special. The traditional root vegetables that are added to the soup while cooking are carrots, celery, onion, and parsnips. Fresh parsley and dill with the stems on also add a great flavor to the broth during cooking. 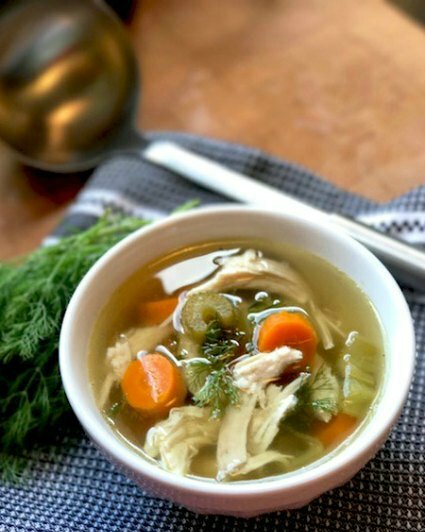 No need to feel intimated by making homemade chicken soup. Once you try this recipe, your friends and family will keep begging you to whip up some Jewish Penicillin whenever they feel a sniffle come on. You can enjoy the broth with just chicken and vegetables or you can add noodles or matzo balls. I have provided instructions to simmer the soup on the stovetop and if you are looking to save time, Instant Pot pressure cooker instructions are also provided. 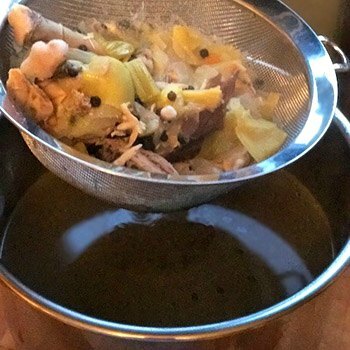 The tradition for soup broth comes from Northen Europe, where families would use the remaining meat bones, scraps of meat and vegetables to cook up soup to provide flavor and sustenance for their families. It was strongly believed not to let any food go to waste, especially out of necessity if a family needed to stretch their earnings. Many Jewish families across Europe favored raising their own chickens instead of pigs. This may explain why chicken soup is favored and considered Jewish soul food. Jewish chicken soup is also the base for Chicken Matzo Ball Soup which is an important menu item featured in many Jewish holiday meals. Learn more about the tradition of Jewish Passover and a Passover Seder Menu with Recipes from Ellen Easton. * It is important in Jewish traditional chicken broth to leave the skin on the chicken while simmering in water. Much of the rich flavor and golden color comes from the chicken skin. ** Use cloves as in the spice, not garlic. Clear out both openings of the chicken and remove any giblets. Pat dry the chicken with a paper towel and place in a large stockpot. 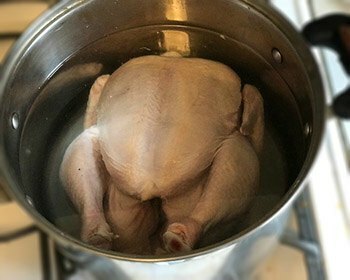 Fill the pot with cold water until the chicken is covered by about an inch of water. Place the stockpot of chicken on the stove over medium-high heat. When the water comes to a boil, turn the heat down to medium-low to let simmer. During the first part of the simmering process, you will see foam rise to the top of the water and clump together. Use a large spoon to skim off the foam and discard. Once all the foam has stopped producing, add back hot water to the pot so the chicken is covered by at least an inch again. Add the carrots, celery, onion, parsnip, peppercorns, kosher salt, cloves, bay leaves, parsley and dill to the pot of chicken stock. Cover with a lid, but allow some venting and let the stock cook at a steady simmer. If it starts to boil too hard, the broth results will be cloudy. (steady bubbles coming up with steam, but not a rolling boil). Let the stock cook for 1 1/2 to 2 hours until the chicken meat is cooked and tender. You may have to occasionally add more water to keep the chicken covered. When the chicken is done cooking, turn off the heat. Use large tongs to transfer the chicken and vegetables to a cutting board and let cool. Pour the stock from the pot through a strainer into another large pot or large bowl. Discard any remaining herbs, spices, and onion chunks. This will give you a nice clear golden chicken broth. Season with kosher salt and pepper to taste. If desired, cover and refrigerate the broth for up to 8 hours and skim off any hardened fat from the surface and save the fat to use in other recipes. Otherwise, let the broth cool down for a couple hours and use a spoon to skim off the fat that is rising to the surface and discard. Note: Rendered chicken fat skimmed off the top of cooled chicken broth is also known as the Jewish term "schmaltz". You can save that fat to help bind matzo balls in Chicken Matzo Ball Soup, or wrap the fat in plastic and freeze to use as a shortening replacement in other savory recipes such as homemade biscuits. When the chicken is cooled, pull the meat off the bones and shred. Set aside the chicken meat until ready to use. Discard the chicken carcass and skin. Chop up the carrots and celery into smaller bite-sized pieces. In a large 5 quart Dutch oven, over medium heat, add the chopped vegetables and chicken broth. Note: If you do not prefer really soft vegetables in your soup, you can discard all the vegetables from your stock, and chop up fresh carrots, celery and parsnip and saute with a couple tablespoons chicken fat (schmaltz) or butter for a few minutes, until softened. Then add the sauteed vegetables to the broth. Heat the vegetables and broth until they just start to boil, add noodles if desired and bring the soup back up to a boil, then turn the heat down to medium-low to let the soup simmer until the noodles have become tender. Stir in the chicken meat and let simmer for a few minutes until heated through. Season with salt and pepper to taste. Ladle the soup in bowls to serve and garnish the tops with chopped fresh parsley or dill. Place a trivet with handles facing upwards inside the inner pot. Clear out both openings of the chicken and remove any giblets. Pat dry the chicken with a paper towel and place on top of the trivet inside the inner pot. Add the carrots, celery, onion, parsnip, peppercorns, kosher salt, cloves, bay leaves, parsley and dill on top of the chicken. (Tuck vegetables into open pockets of space to make enough room in the inner pot.) Note: If you are using a 6 quart Instant Pot, reduce the number of vegetables to have enough room in the inner pot. If using an 8 quart Instant Pot then the amount on the ingredient list should be fine. Fill the inner pot with enough cold water to cover the chicken. Place the inner pot inside the Instant Pot appliance and cover with lid. Close the lid to the sealing position. Next, make sure the pressure valve is closed to the sealing position. Press the Manual button, with the High-Pressure setting. Adjust the pressure cooking time to 30 minutes. When the pressure cooking time is completed, let the pressure naturally release until you see the pressure pin drop. (this could take 25-30 minutes since there is a large quantity of liquid in the pot.) Press the Keep Warm/Cancel button to turn off the Instant Pot and open the lid and set aside. Using tongs, pull out the carrots and celery to a cutting board to let cool. Place silicon mitts on your hands for protection and grab the trivet handles to pull the chicken up and out of the Instant Pot. Place the chicken on a plate and cover with a foil tent to let cool. Pour the stock from the inner pot through a strainer into another large pot or large bowl. Discard any remaining herbs, spices, and onion chunks. This will give you a nice clear golden chicken broth. Season with kosher salt and pepper to taste. If desired, cover and refrigerate the broth for up to 8 hours and skim off any hardened fat from the surface and save the fat to use in other recipes. Otherwise, let the broth cool down for a couple hours and use a spoon to skim off the fat that is rising to the surface and discard. When the chicken is cooled, pull the meat off the bones and shred. Set aside the chicken meat until ready to use. Discard the chicken carcass and skin. Chop up the carrots and celery into smaller bite-sized pieces. Add the chopped vegetables and chicken broth back into the inner pot. Note: If you do not prefer really soft vegetables in your soup, you can discard all the vegetables from your stock, and chop up fresh carrots, celery and parsnip and saute with a couple tablespoons chicken fat (schmaltz) or butter for a few minutes, until softened. Then add the sauteed vegetables to the broth. Press the Saute button and then press the Adjust button until you see the "More" heat setting on the panel. Once the broth starts to come to a boil, add noodles if desired and bring the soup back up to a boil. Let the soup simmer until the noodles have become tender. Stir in the chicken meat and let simmer for a few minutes until heated through. Season with salt and pepper to taste. Ladle the soup into bowls to serve and garnish the tops with chopped fresh parsley or dill. “A Superior Chicken Soup“, The New York Times, Food section, article by Julia Moskin, November 29, 2016. Absolutely wonderful taste, I will be making this recipe from now on. I did my final college term paper on Jewish penicillin in 1995. I earned an A+ on my presentation. I make a hugh pot of it every flu season. Thanks Charlotte 🙂 I’d love your recipe… Do I need to buy a huge pot? Do you have a copy of that paper? Would be interested to read!! I’ve been served the Hebrew version of chicken soup since I was little, whenever sick, my last name was changed during the breakup of Jerusalem many years ago it’s actually the equivalent name in Hebrew, thank you. I’m excited to try this recipe but am curious because it looks like there are leeks in the picture. Did you use them? You can use leeks or onions. I was checking out different recipes for “chicken soups.” I checked out “Jewish Chicken Soup.” It’s the same one I have made all my married life. (53 years ) I did’t even know how to cook. I just watched my Grandmom, and Mother put it together. We’re Italian. It’s delicious, it’s international. Ha ha ha. Do you also use the same types of herbs and spices in the Italian version from your family or do they differ? Do you mean 3 cloves or 3 garlic cloves? The recipe calls for adding optional 3 whole cloves as in the spice. The footnote says clove the spice, not garlic! I just recently added the footnote to avoid future confusion. 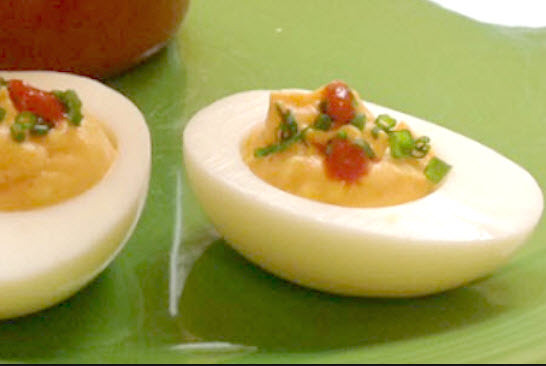 This is the same recipe (above) I got from my Jewish mother-in-law in New York in the 70s. 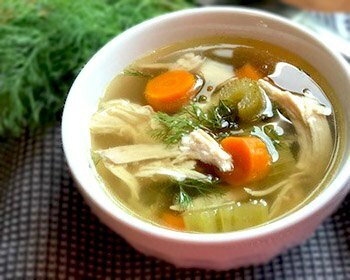 I now live in Bern/ Switzerland, I am not Jewish, but still prepare this version of Chicken soup whenever somebody close to me is sick, and needs it! Did not see these in the recipe. They would be a nice addition, if I missed them. For this recipe only stovetop and electric pressure cooker instructions have been provided. For slow cooker you can place chicken and stock ingredients and cover chicken with water. Cook for 4-5 hours on high or 8 hours on low. Remove chicken and strain the stock (save the carrots,celery, parsnips). Separate the chicken meat and discard the skin and bones. Place the stock, cut up vegetables, chicken back into the slow cooker. Season to taste and serve. If you want to use fresh vegetables then cook for additional hour on high heat until the vegetables have softened. Yes the schmaltz will work great as a fat replacement for the matzoh balls. I would like to use a kosher chicken, but my grocery store only sells them in pieces. Since it’s still a whole chicken I use that instead? Yes, using chicken sections is fine.